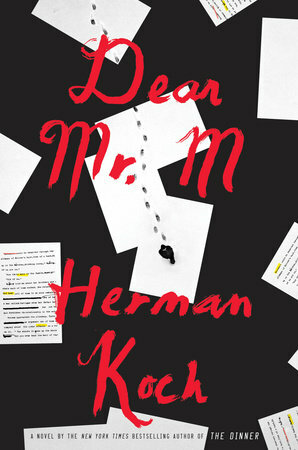 Here's the synopsis for Dear Mr. M, as featured on its cover. Once a celebrated writer, M had his greatest success with a suspense novel based on a real-life disappearance. It told the story of a history teacher who went missing one winter after having a brief affair with a beautiful student of his. The teacher was never found. Upon publication, M's novel was a runaway bestseller, one that marked his international breakthrough. That was years ago, and now M's career is fading. But not when it comes to his bizarre, seemingly timid neighbor who keeps a close eye on him and his wife. Why? From alternating points of view, where no one is to be trusted, Herman Koch weaves together an intricate tale of a writer in decline, a teenage couple in love, a missing teacher, and a single book that entwines all of their fates. Thanks to M's novel, supposedly a work of fiction, everyone seems to be linked forever, until something unexpected spins the "story" off its rails. With ever increasing tension, his signature sardonic wit and world-renowned sharp eye for human failings, Herman Koch once again spares nothing and no one in his gripping new novel, a barbed performance that suspends readers in the mysterious space between fact and fiction. The reason I copied and pasted the synopsis, rather than described it using my own words, is because this book was complex, and difficult to follow. I'm disappointed -- in myself for not being able to follow along, and in the novel because it failed to hold my interest. Mr. M's character reminded me of Noah Solloway's character from The Affair. That's exactly who I envisioned in every Mr. M scene. Considering how much I loved The Dinner, I really do dig Koch's writing style. Dear Mr. M hasn't scared me away from Koch at all.